March 27, 2019 | Filed under: Current Articles,Featured | Posted by: Alex A. The Old Farmers’ Almanac has maintained an enduring and faithful readership since its inception in 1792. Early farmers took the Almanac’s advice very seriously for planning, predictions, planting, and animal health. While the world has changed much over the centuries, the Almanac’s Best Days advice continues to be one of its most popular features, right in league with its long range weather forecasts. There is a short astrology section in every edition of the Almanac, along with the Secrets of the Zodiac and the Man of Signs graphics. Almanac devotees use its astronomical data and astrological tables to determine the timing of a variety of events. Astrology interprets the influence that the sun and moon exert on people, animals, and even weather, while the planets are in a specific zodiac sign. The phases of the moon and its visual proximity to a constellation or a planet were, and still are, used to determine the most fortuitous times for a variety of activities. 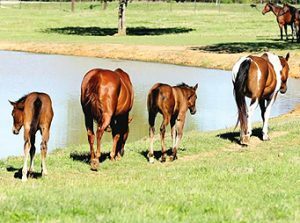 The practice is referred to as using “the Signs,” and some horse breeders still use them to determine the best days for weaning foals. Most horsemen will say that there is no hard and fast time to wean a foal since age isn’t as important as physical, mental, and social development. Some opt for the three month mark, while others leave a mare and foal together until the baby is four, five, or even six months old. Regardless of the age of the foal, most everyone agrees that reducing stress for both mom and baby is vital for both to thrive. The theory of the Signs is that the physical and emotional stress of weaning will be at its lowest on certain days of the lunar cycle. Decades of anecdotal evidence and success keep this very old tradition alive and relevant in an age of scientific advances like embryo transfers and infrared thermography.